Ultra-strength silica protection - spray on, wipe away! Wolfgang Uber SiO2 Silica Spray uses a blend of silica dioxide and super-polymers to create an long-lasting and hard-as-nails finish on your painted surfaces. Wolfgang Uber SiO2 Silica Spray is easy to use and within minutes will impart a hydrophobic layer that shines like a wax and protects like a paint sealant. Perfect for use as a stand-alone sealant or as a topper on the paint coating that’s already been applied, Wolfgang Uber SiO2 Silica Spray provides the protection your need with the level of shine that you want. Wolfgang Uber SiO2 Silica Spray provides extreme hydrophobicity to your paint and provides exceptional waterbeading. 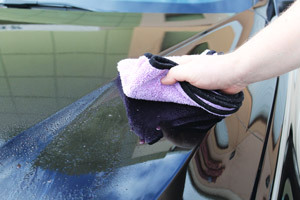 In this new era of detailing, there are many and more ways your paint can be protected – car waxes, car sealants, paint coatings, and now, SiO2 spray sealants. While waxes and paint coatings tend to dominate the market, Wolfgang Uber SiO2 Silica Spray is making a name for itself when it comes to easy to apply paint protection. With an average protection time of up to 6 months, Wolfgang Uber SiO2 Silica Spray outlasts your favorite car wax without compromising the deep shine you’ve come to love! Wolfgang Uber SiO2 Silica Spray uses silica dioxide (most commonly found in nature as quartz) to provide a rock-hard layer of protection on your paint. This level of protection creates an extremely high surface tension which, in turn, makes the surface almost waterproof. Instead of pooling on the surface, Wolfgang Uber SiO2 Silica Spray makes the water (and other surface contaminants) roll right off! In addition to extreme levels of hydrophobicity, Wolfgang Uber SiO2 Silica Spray leaves a slick finish that helps keep your car cleaner, as well as making it easier to clean next time. And of course, you can’t have a high gloss without a slick surface! On top of being able to provide a crystal clear, hydrophobic finish in just minutes, Wolfgang Uber SiO2 Silica Spray is also extremely easy to apply! 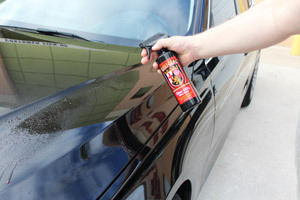 Simply spray onto the surface to be treated and buff away! 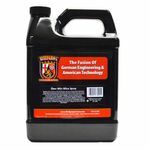 Wolfgang Uber SiO2 Silica Spray is perfect as a quick, stand-alone paint sealant and can be applied as often as you want! Have a vehicle that’s already coated with a ceramic or quartz-based coating? Use Wolfgang Uber SiO2 Silica Spray to boost your paint coating’s hydrophobicity and gloss levels! Regardless of which method of paint protection you’ve used in the past, Wolfgang Uber SiO2 Silica Spray is a stand-out, spray-on paint sealant/coating that can’t be missed! Wolfgang Uber SiO2 Silica Spray works best on a freshly washed and dried surface. Being cautious of overspray, spray an even layer directly onto the area to be treated. 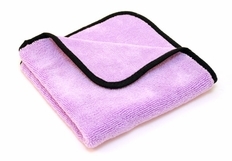 Using a clean and soft microfiber buffing towel, gently buff product away from the surface. Flip your towel to a clean side and remove any excess product. No cure time is necessary! Wolfgang Uber SiO2 Silica Spray 128 oz. Now in Stock!